Caring for family pets is a big responsibility! Pets need patience, love and attention, food and water, grooming, exercise, playtime, and medical care throughout their lives. Sounds a lot like what we all require, especially kids! So with that, it is important to remember that as kids are learning responsibilities in life, they also must learn that pets are living creatures that deserve to be treated kindly and with compassion, and that they are a lifetime commitment. This can be very time consuming, but well worth the effort. The level of responsibility you teach a child certainly depends on their age. How much responsibility do you think he or she can handle? What would be age-appropriate and considered safe for him or her to do? Overall, as a parent, you are responsible for supervision in pet caretaking by making sure the pet is well cared for. If there is already a pet in the home, kids will have an idea of what it takes to care for one, but still may need oversight in overall pet care. If a pet is not yet in the home, it can be helpful to start with a “pretend animal” and teach kids the basics of care that way first. Help kids understand that sometimes pets do not want attention, and give examples of what that looks like so they can be respectful of that. Some pets like hugs and some don’t, so it’s important for kids to understand acceptable ways to show affection. Teaching a gentle, calm approach with pets is important. Sometimes it’s important to leave pets alone. This is especially true when they are not feeling well, or they’ve had an eventful day. Teach kids how to interact appropriately with new animals. This includes animals they meet when you’re out around town. When you come across people walking their pets, always ask the owner before approaching an animal. Remind children they must always be respectful, gentle, and cautious when meeting new animals. Make it easy for kids to complete their tasks. For instance, you can draw out instructions and tape to a food container so they know how much to feed the pet. Children can easily become overwhelmed when too much is required of them, so finding a balance that keeps them enthused and participating without feeling overwhelmed is key. Reward smaller kids with a daily “star” for their efforts in helping with a pet-related chore. Children need praise and reward for completing tasks. Positive reinforcement promotes positive results. Offer an allowance of sorts for helping with pets. This could be in the form of a “point system” where a certain number of points are given for specific chores that can be cashed in later for various things. A most valuable tool in teaching kids to be responsible pet caretakers is to set an example by fulfilling this role well ourselves! Note: There are many books available on teaching kids how to interact with animals. *Readers are reminded it is entirely of their own accord, right, and responsibility to make informed and educated decisions on their pet’s health care. Jenny Magli disclaims any liability for the decisions you make based on this information. Jenny is a Certified Natural Health Consultant for pets and their people, and an Animal Iridology, Healing Touch for Animals (Level 2) and NES Bioenergetics practitioner. She is available for consultations and presentations. She can be reached at (906) 235-3524 or 1healthlink@gmail.com. I’ve made a career of technology. I’m an advocate of computer science education programs in our communities and public schools. I use a smartphone, a computer, and dozens of applications and internet resources every day, so it may seem odd that I don’t let my kids have a smartphone. My eleven-year-old daughter wrote me an impressive, persuasive letter requesting a phone as a school assignment. I wrote her a letter in return. I took the opportunity to tell my daughter how much I love her, admire her, and have been proud of her patient efforts to convince me of her need for a phone. She’s been logical and creative in her approach. I had to give her credit. I have valid concerns, too – screen time, addictive distraction, cyber-bullying, texting, access to inappropriate or dangerous material. My core reason? I want to preserve her childhood. I want her to hold on to her ability to just be. I don’t want a phone taking over the spaces of her life that she fills with her innocence, presence, love of nature, and active pursuits. I don’t want texting and social media to consume the time she spends biking, writing, drawing, storytelling, or playing guitar. I want to spare her the dark side of technology. So, I was honest. I wrote to her about her cherished childhood and about how much a phone can get in the way of the most joyous parts of life. I used myself as an example. I told her honestly about how technology sometimes consumes my time. I acknowledged my own distractions that she’s often noted with frustration. I reminded her of stories she’d shared with me about friends’ fixation on their phones. Responsibility – A smartphone is an expensive piece of equipment. It needs to be cared for and used responsibly: communicating maturely and respectfully with others, not bullying or gossiping; making good choices in online content, knowing when something is inappropriate; putting the phone down when it’s time to do other things. Integrity and Trust – A smartphone gives access to apps and the internet, to communicating with people without parents knowing. With it come temptations and risks such as bullying, sending inappropriate pictures, communicating with prohibited people, and looking at adult content, so strong integrity and trustworthiness must be demonstrated. Gratitude – A phone is a privilege. Far more people in the world do not have phones than do. A child who lives in a home with a loving family, regular food on the table, and clean drinking water is more fortunate than most. It’s important to be grateful for the things we have. A child who doesn’t recognize good fortune, express gratitude, and share his or her good fortune where possible is not ready to have a phone. Presence – The greatest gifts we receive are simply our life and time. A phone brings a big potential drain on time, focus, and presence. So showing consistent ability to be present without a phone is a good step toward maintaining presence with a phone. Money – Phones cost money up-front and every month thereafter, so one must have an understanding of money, value the things it’s used for, make good decisions about money, and be ready to help pay for the phone to be ready to have one. I gave my daughter clear examples of how she could demonstrate maturity in each of these areas and told her that over the next year, we’d communicate and focus on these things with the goal of showing her readiness for a phone. I told her she could also hold me accountable for the things I was expecting of her. I closed the letter with a reminder of my love and admiration for her. She was happy to have a clear answer and seemed to beam with a sense of satisfaction over how it was delivered. I don’t know when a child should get a phone. It’s a thorny parenting issue. I’m glad now to have created a clear construct for mature, respectful conversation with my daughter about it. I feel good about having empowered her to work on showing me when she’s ready. I can’t turn back the hands of time to simpler days when smartphones didn’t exist. Hopefully, though, with positive parenting, I can help her learn balance to preserve the simple joys in her life when she’s got her own phone. Keith Glendon, father to three daughters and a son, a husband and practitioner of joy, always wanted to be a writer. In his early forties, he changed “I want to be a writer” to “I am a writer.” He’s grateful to share his voice with you. Challenging behavior – why does it seem to be right in front of us, perhaps more often than we would like?! I would like to empower those who have daily interaction with young children. With the power of knowledge, you will be better prepared to respond to and deal with conflict. Knowledge of child development will help keep your young relationship in good standing. Did you know that before the age of six, information is processed twelve times slower than in adults? Children six to twelve process information six times slower than adults! What does that mean? When we walk into a room and quickly announce we need to leave; Mommy has a meeting and I need you to turn off the TV, get your shoes and backpack, and a jacket just in case it cools down; we need to leave in just a few minutes, so be quick!” Rarely does this common scenario take place without Mom or Dad getting flustered. Try this – while turning off the TV, give the command, “get your shoes and backpack.” Truly adults need to s. l. o. w. the pace down! How many times a day have you said the word “don’t”? Young children cannot conjugate the word “don’t” and therefore when you say “don’t throw the sand”, they hear “throw the sand” and you march over to the sandbox with the “challenging me again” thought! We need to tell children what to do! “Use the bulldozer to move the sand!” It takes work to tell children what we want them to do. “Don’t” really doesn’t give them any information and “no” certainly doesn’t provide more information either. Instead, tell children what to do. Teach them what YOU want them TO DO! Children under seven lack mature “inner speech.” In adults, inner speech is like a rehearsal for what we may want to say when arriving at a new acquaintance’s place or how we might want to prepare a meal. We can even quickly think “oh, what I would like to say” but use our filter and think before we act! Young children see in pictures. Adults need to paint a picture with their words. Remember, don’t” and “no” provide no information. For example, “You seem anxious, you pushed your friend when you walked into the room. You may not push, you may come to me and stand by me if you feel anxious.” Using descriptive language helps defuse those unwanted verbal power struggles and is also a stepping stone for language and literacy, so utilize it as often and fully as possible. If you’re in the teaching field or just simply read to children, it’s helpful to know that binocular vision, the ability of both eyes to focus on the same subject, doesn’t fully mature until around age six. Until then, it is like covering one eye, spinning around and trying to walk down steps! Reading a story to children and moving the book in front of their eyes is continuous motion. In a group you’ll get the child in front saying, “I didn’t see the picture!” They follow the book and the children in back begin to say, “I didn’t see the picture!” Suddenly everyone is scooting, on their knees, and saying, “I didn’t see the picture!” Instead, hold the book still, move it, then hold it still again. We should pay attention to children’s behavior. Though it appears to us that they’ve seen the picture, they haven’t and they are not making it up! There is so much we can do to help children plug into the rational part of the brain. We can do the same! Be a S.T.A.R. – Smile, Take a deep breath, And Relax! I know you can do it! Teach your child or children the same. Kathy Harsch has followed Dr. Becky Bailey’s teachings since attending her 2000 Marquette Early Childhood Conference presentation. She’s since attended many of Dr. Bailey’s conferences and continues to teach and learn from Conscious Discipline, School Family, and Brain Smart ways, incorporating them in her day care. *Conscious Discipline™, School Family T, and Brain Smart™, are trademarks of Loving Guidance, Inc. 1-800-842-2846 www.ConsciousDiscipline.com. In the mid-1980s, I had been treating for over a year, Eliza, an 8-year-old adopted girl who had been severely abused by her biological parents. In spite of her caring adoptive parents, Eliza was not making progress. One day, she walked into my familiar office at the local mental health center (now called Pathways), looked around at the bookshelves full of toys and books, and inquired what they were. I was stunned! Serendipitously, a few months earlier, the clinic’s psychiatrist, Dr. Lu Kuhnhoff, who had just returned from a conference sponsored by the International Society for the Study of Dissociative Disorders, provided an in-service to a group of us interested clinicians. Dr. Kuhnhoff described signs of dissociation, including memory and identity disturbances, auditory and visual hallucinations, and a loss of consciousness (awareness). At this time, I had been specializing in treatment of sexually-abused children. I naively thought to myself that perhaps I would see one case with dissociation in my lifetime. Little did I understand that dissociation is a primitive, biological, automatic defense mechanism derived from reptiles and continued up the evolutionary chain to us mammals. Dissociation is activated when a child is faced with overwhelming fear when being abused or encountering other forms of trauma (e.g. painful medical procedures and illness), and when fighting and fleeing is simply impossible. In order to survive the frightening experience, the child segments off the horrifying event(s) from his or her consciousness as a way of escaping mentally when there is no actual way to escape. Like other forms of mental conditions, there are different degrees of dissociation, such as: spacing out; amnesia to past traumatic events; distortion in environment in which things seem unreal or viewed through a tunnel; when the body feels numb or disconnected from self; or the child experiences a separation within the self with different identities, feelings, memories, behaviors and relationship preferences that influence the child or may take control of the body and present differently to others, as seen in Dissociative Identity Disorder-DID (formerly termed Multiple Personality Disorder). It is important to understand that those with DID are still one person with different states of consciousness or awareness. In my book Healing the Fractured Child: Diagnosing and Treating Youth with \Dissociation, I explain more thoroughly the ways dissociative symptoms can be expressed in numerous clinical cases. Generally, traumatized children with dissociation can present with a myriad of symptoms due to shifting parts of themselves that become triggered by reminders of past traumas, e.g., smells, sights, sounds, touch. They can rapidly shift from being happy to sad to raging, and display aberrant behavior in which amnesia may be present. They can exhibit dramatic shifts in their abilities with activities such as schoolwork and sports, and in their preferences in food, dress, activities, and more. They can demonstrate severe attachment or relationship impairment due to a lack of trust and separate parts of the self not having a connection to their caregivers. These children can one moment seek out the parent and the next moment attack the parent. They often have severe attention problems marked by poor concentration and focus due to intrusive traumatic memories, or voices and images experienced in their mind that disrupt their ability to focus. They can exhibit aggressive behavior for which they have no memory, and therefore deny such behavior. Consequently, they are frequently viewed as liars. These changing moods and behaviors can confound caretakers and teachers. I received a call from a grade school principal who told me Ryan, a 9-year-old boy (Waters, 2015) who’d been sexually abused, had turned around and suddenly hit a girl in line. When the principal witnessed this and confronted Ryan, he adamantly denied it, collapsing to the floor wailing. However, in this case, the astute principal related to me that Ryan really did not know he had done it. I knew Ryan depersonalized from his lower body since he was completely unaware of his chronic soiling problem. However, I did not know he had a more severe form of dissociation until this phone call. Upon further exploration, he, like Eliza, revealed hearing voices and seeing in his mind a separate identity that was a protector who hit the little girl who had unexpectedly knocked into him. These traumatized, dissociative children can often receive more commonly recognized diagnoses, such as psychosis due to hallucinations, bipolar disorder due to extreme mood swings, attention deficit disorder due to poor focus, oppositional or conduct disorders due to their disruptive behavior. Unfortunately, while they have an abuse history, post-traumatic stress and dissociative disorders are often overlooked as the source of their symptoms. Effectively parenting these children can be a daunting task. Porges (2011), who has studied how we respond to threat, discovered the crucial role of voice and eyes in fostering communication and bonding between parents and children. Porges noted that the mylenated vagal nerve, which regulates social engagement and goes from the heart to the ears and from the heart to the eyes, makes us very sensitive to loud, low sounds and angry eyes. We become threatened and our survival response system activates, causing us to disengage from the person by fighting, fleeing or freezing (a dissociative response). Therefore, Porges stresses that keeping your voice modulated and eyes warm can keep others engaged-a crucial strategy for parents to maintain a connection with their distraught child. While it is challenging to raise a dissociative child, parents or caretakers can have a profound impact on helping their child heal. Their understanding, love, patience, and acceptance of all parts of their child provide the foundation for the child to progress in specialized treatment of his or her traumatic past and dissociation to become an integrated child. Having had the privilege of working in partnership with such parents to see their children transform into healthy, happy individuals, I can tell you the rewards of their helping their child heal are worth it! Fran Waters is the author of Healing the fractured child: Diagnosis and treatment of youth with dissociation. She is the past president of the International Society for the Study of Trauma & Dissociation (ISSTD). She maintains a private practice in Marquette, MI. Porges, S. (2011). The polyvagal theory: Neurophysiological foundations of emotions, attachment, communication and self-regulation. New York: W.W. Norton. Waters, F. S. (2nd, 2015). Ryan (8 to 10 years old) –Connecting with the body: Treatment of somatoform dissociation (encopresis and multiple physical complaints). In Wieland, S. (Ed. ), Dissociation in traumatized children and adolescents: Theory and clinical interventions (2nd ed. ; pp.135-190). New York: Routledge. Reprinted with permission from the Winter 2016-2017 issue of Health & Happiness U.P. Magazine. Announcing Health & Happiness’s 2013 Donation! As part of Year Two of Health & Happiness U.P. Magazine’s 5-year commitment to increased support for a different area of community life each year, we’ve increased our coverage of youth and parenting issues and have chosen two local children’s programs to receive our annual donation – Start the Cycle, and Music 4 All Kids. We’d like to thank those advertisers who have generously added to this donation – Moonstone Gallery, Coco’s Restaurant, Panara Imports, Hempy’s Company, Huron Earth Deli, Alicia Smith Dambeck, LAc, CH, Aurelia Holistic Health & Healing, Wendi Greer, CSW, Natural Connections, Serendipity Salon, Intuitive Learning Creations, Elements of Consignment, Intentional Healing, Joy Center, and Northstar Employee Assistance Program. Click here for more on Music 4 All Kids, including MFAK Director Shane Murray’s response to receiving our donation. We look forward to including a special feature on Start the Cycle in an upcoming issue. And please comment here to let us know what you’d like to see added to our youth and parenting content, or on our Facebook page. Our special Season for Giving & Living Health & Happiness issue goes to press today! It will be delivered to over 250 Marquette & Alger County locations over the next week. I hope it will inspire you to do just that, for an extra wonderful holiday, and beyond! What is Music 4 All Kids? It’s a non-profit organization devoted to the advancement of youth ages five to eighteen through learning, applying and teaching music, regardless of a student’s ability to pay. We work with students at our local facility, (MacDonald’s Music), as well as Marquette’s Alternative High School and YMCA. We teach individual lessons and workshops, along with a comprehensive four-phase advancement program that culminates in students becoming instructors. In the first stage, students learn the fundamentals of music, begin lessons on an instrument of their choice, and have access to one-on-one mentorship for building confidence and motivation. In the second stage, students can join an ensemble of two to four peers playing many genres of music. Social skills are developed while expanding their social circle. Once students have advanced, they get to experience engineering and recording. In this third stage, they create their own productions and promote them, which develops their job skills. Working on a project and producing a finished piece is a great experience for our students! Those who reach Stage 4 can become student instructors. They work with our team, learning how to lead workshops and teach beginning lessons. This gives them a sense of accomplishment while promoting leadership skills, and the good feelings that result from passing on what they’ve learned to another student. We have a talented staff of directors and teachers, plus a board of directors. And we’re partnered with the Cedar Tree Insitute. What inspired you to found this program? My mom’s work as Director of Great Lakes Recovery Centers for twenty-seven years inspired me to become a counselor in that field, working for seven years with kids with substance abuse problems in residential settings. As a musician, I later began teaching music lessons in Marquette to kids. While teaching, I realized there was a local need to help children thrive and become better students overall through music and mentoring. So I decided to create a nonprofit to help reach these goals. We just finished our first instructor training program on October 26th and 27th. Fifteen instructors, local professional musicians and social workers, were trained. We’re implementing the program at the Marquette Alternative High School and the YMCA, along with other community nonprofits. The passion of the musicians and teachers at the instructor program was amazing, and we all can’t wait to share our passion with the students! What successes have you seen with the program so far? The children in the program are thriving, excelling in school and life. And we had a student who’s been part of the program since it began attend our instructor training program. This year she attended the Blue Lake Fine Arts Camps on a scholarship. We are excited to expand our staff, and to begin teaching in the Alternative School – which currently has no music program! We’re a nonprofit, so we rely solely on donations from the community, and are working hard to obtain grants. We’re constantly looking for donations of instruments, new and used, as well as sponsors from local businesses, and anyone in the community who believes in children, music and personal growth, that can assist us with monetary donations. 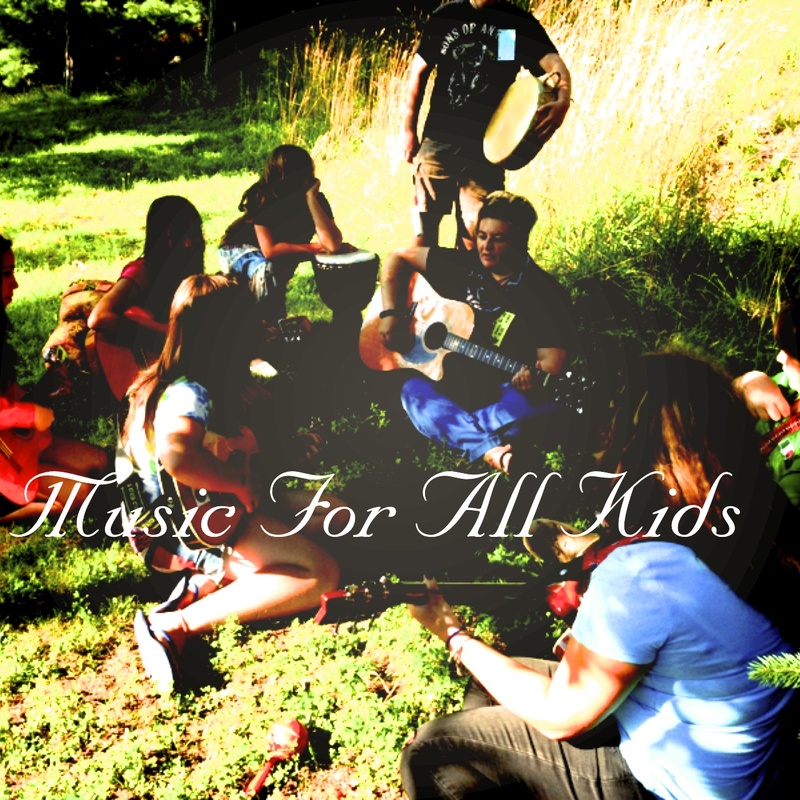 What else would you like people to know about Music 4 All Kids? Research shows children who participate in music programs become better students. Our program teaches and mentors children. We believe in the power of music in a child’s life, and the power of a positive role model. Music can expand and grow your life, and we are excited to bring music to children who don’t have that benefit through their school system. If there is a child you know who could benefit, or needs a mentor or a musical mentor, contact us. Our new website is http://www.music4allkids.us, and my number is 906-235-5163. Additional funds would help us to expand our program by providing funding for those students in our target demographic, as well as add a wider variety of musical instruction to our current program. If you or anyone you know would like to make a donation of instruments or money, we thank you, and the children in the program thank you! And what did Shane say when we surprised her last night with news of Health & Happiness’s donation? Oh my God! That’s great! That means so much. Wow, thank you! Be sure to check out their website, www.music4allkids.us and Facebook page for more on their program!